This drawing is one of a series of meditations on error. Each begins with the perimeter line of a perfect circle and evolves from my repeated attempts to perfectly copy the preceding line. My mistakes create the drawing’s fascinating shapes, reminiscent of fingerprints and tree rings. Mistakes are all too often seen as negative and painful, however, if we take the time to consider the possibilities that they may offer, they can also be sources of learning, inspiration, discovery and reconciliation. 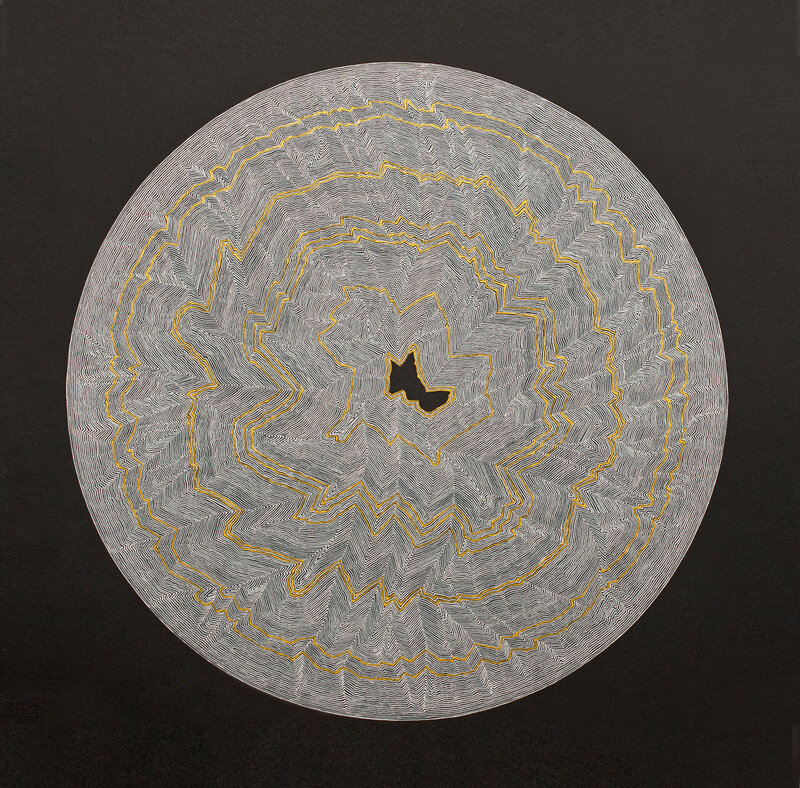 The use of gold in this particular drawing is inspired by the related Japanese philosophies of kintsugi and wabi-sabi. Literally meaning ‘golden repair’ kintsugi reveals the scars of time and mishap in its approach to broken objects. Wabi-Sabi is an aesthetic centred on the acceptance of flaws and transience, finding beauty in the impermanent, incomplete and imperfect. As a Quaker, I believe that there is something of God in everyone. One place that God (or Good) might be found in our 21st century world is in the process of learning from, and acceptance of, our mistakes as well as those made by others.